It's been a long time since Chevrolet had a decent off-road vehicle in its stable. You might have to go all the way back to the original S-10 ZR2 or Blazer ZR2 in the mid- 1990s to the mid-2000s. And the fact that GM employees who worked on the 2017 Chevrolet Colorado ZR2 had experience with the Hummer brand was not lost on us. No matter how Chevy got to this point, we take it as a good sign that it's back on the off-road trail and producing an impressive pickup. Here are the five standout features you'll find on the ZR2. This isn't a comprehensive list, but these are the ones we find most intriguing. Those who spend a lot of time on bad roads will drool over the Multimatic Dynamic Suspensions Spool Valve shock absorbers. The spool-valve technology allows the Multimatic tuners (GM does not own this technology) to deliver an impressive range of high- and low-speed capabilities. The shocks take up a lot of space under the truck, but their range of capability is wider than any factory-offered shocks we've experienced. No matter how hard we pushed them, we couldn't get them heated. It's no surprise that the transfer case, which houses the 4x4's low-range gearing, is the heart of this off-road machine, but what surprised us is the versatility and flexibility of the system. It allows for front- and rear-locking differentials in each of the four drivetrain modes — two-wheel drive, all-wheel drive, 4-High lock and 4-Low lock — and it also offers a tire-spinning Off-Road mode that gives the stability and traction control system a little more latitude before power is pulled from the engine. This is an often overlooked aspect of many pickups, but there are some players — especially now that many systems are electronically controlled — that are doing a solid job of tuning steering systems to accommodate a wider range of driving situations. For example, the Ford F-150 Raptor has three separate settings, depending on which mode you select. Likewise, the Ford Super Duty (without electronic controls) offers a ratio-changing gear to give the driver better control at speed or in parking lots. Although the ZR2 has neither of those capabilities, it does have an impressively smooth and adjustable on- and off-road feel. In fact, even with the front locker engaged and the wheels at full lock, you do not get the typical "crow hop" that many other pickups exhibit. We normally don't like anything that decreases the amount of room available for a load in a pickup's bed, but in this case, we'll make an exception. GM Accessories will offer a spare tire carrier for the bed of both the 6.5-foot extended-cab and 5.5-foot crew-cab beds so ZR2 owners can move the spare from under the truck into the bed, where it's easily accessible. That's crucial when off-roading. If it were us, we would want a spare under the truck and in the bed, just in case our spare gets a flat. And that's possible, because buyers can purchase the carrier for the bed and keep the other spare under the truck. We know that when engineers put a truck like this together, they look very closely at all the trade-offs. As we've seen with the Raptor and the Toyota Tacoma TRD Pro, the trade-off for off-roading capability is less payload (noted on the door tag here) and towing capacity — two important factors for pickup buyers. We like the fact that the new ZR2 sees only a small reduction in both these areas. It's rated to tow a respectable 5,000 pounds (down from a max towing of 7,600 pounds from the regular Colorado) with payloads of 1,100 pounds for extended cabs and more than 1,200 for crew cabs (down from roughly 1,500 pounds in both configurations for the regular Colorado). First sentence says it all, "Its been a long time...."
Sorry Johnny, you will need to defend this one. It's amazing the amount of influence the "F-word" has. They do. It's all displayed on the lcd screen by the speedometer and tach. Plus the transfer case selector knob will blink while engaging 4HI/4LO and display a solid light when the shift is complete. Nice little truck. 1,220 lbs is respectable for a little truck. That is on par with the crewcab Raptor and 300 lbs less than the Power Wagon. These shocks are going to rust like crazy. Ground clearance doesn't seem like much for a lifted truck. "even with the front locker engaged and the wheels at full lock, you do not get the typical "crow hop" "
That is an interesting remark. I would like to know how they pulled it off. The shocks are very interesting too. ZR2 only has a 2 inch lift. The shocks are aluminum bodied. My basic 2010 Tacoma has a payload rating of 2,200 lbs., updated it myself! Typical liberal media, only showing what they like and not what is wrong with it! As I have stated before, this liberal media has already handed the victory because of buttons and s car like ride! The "aluminum" bodies won't stop the rust. The rust will get under the bodies and it will easily start to corrode and start to look pretty bad after awhile. It happens to other aluminum body shocks as well. You should see my aluminum shocks, they are ugly as sin. It looks like crap and I do not want to see that on my next truck. That said, the dealers won't warranty the finish as it doesn't affect the function of the shock. I had my front shocks replaced as they were leaking and they are already corroded after half of an Ottawa Winter! Normally I wouldn't mind a little rust underneath the truck but these kind of shocks provide a purpose and due to the stickers/and deliberate color casing of them, they are a purposeful advertising-look at me-draw attention part of the vehicle. So I am just warning you guys, you need to coat them with something and keep an eye on them. Please do everybody a favor. Just don't! Your Tacoma was never meant to haul that kind of load. Even under the best circumstances, 2200 pounds is too much for the brakes, steering, springs and tires. Seriously. Just because you can load it that much without shearing off lugs doesn't make it safe or smart to drive like that. This is what trailers are for. @papajim--Not everyone wants to haul a trailer around. Trailers cause global warming. Unless you did an axle swap and braced up the weak stock Tacoma leaf spring mounts, NO YOU DO NOT HAVE A 2200 LB PAYLOAD "RATING". You can just throw on some add-a-leafs and create your own payload "rating". 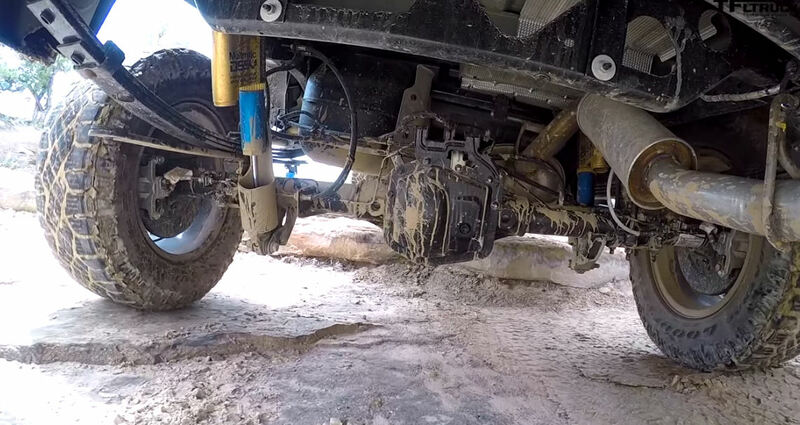 There is nothing "crucial about getting the spare out from under a truck off-road. It remains the best place for a heavy, bulky piece, unless it doesn't fit there. If you can get the truck up to change a tire, you can get the spare out from underneath. The payload and towing on the TRD Pro are not indicated to be any less than on Standard models by Toyota. The payload ratings on The ZR2 or any Tacoma do mean that you run a good chance of being over loaded any time you load the truck up for the weekend. Good to know that the VDC has some useful off-rad modes. Hopefully those can be flashed to the Z71 or even LT grade trucks in the future. Lol, Oxi, it is not liberal reporting. He is reporting HOW THE FACTORY built it. The same mods that are done to your truck can also be done to this truck to improve how it handles weight. However, as everybody else has already pointed out, you cannot up your legal payload. How many times do we have to tell this guy that?